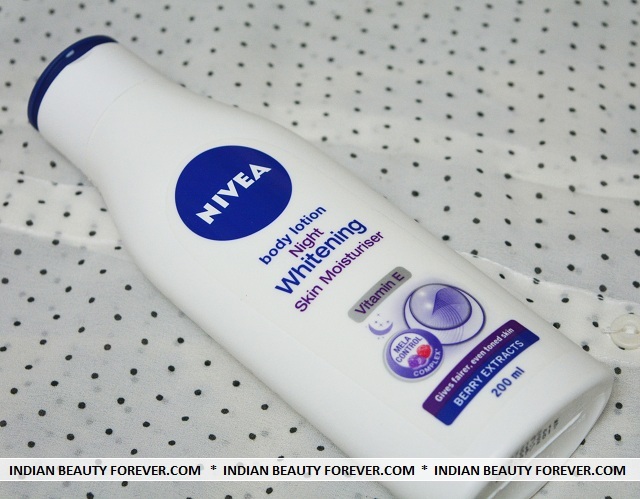 Hi everyone, I will review the latest launch from Nivea which is their Night whitening Body lotion. I have tried all the Nivea Body Lotions Variants as association with Nivea is for the past 3 years, or ever since I started my blog. I personally like Nivea body lotions as they have hydrating and have so many different variants. 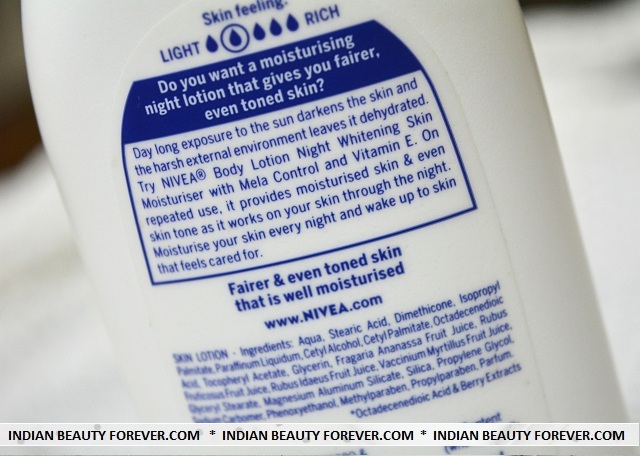 Price: This Night whitening body lotion is for 249 rupees for 200 ml. Claims: Day time sun exposure darkens the skin and the harsh chemicals I the environment leaves it dehydrated. 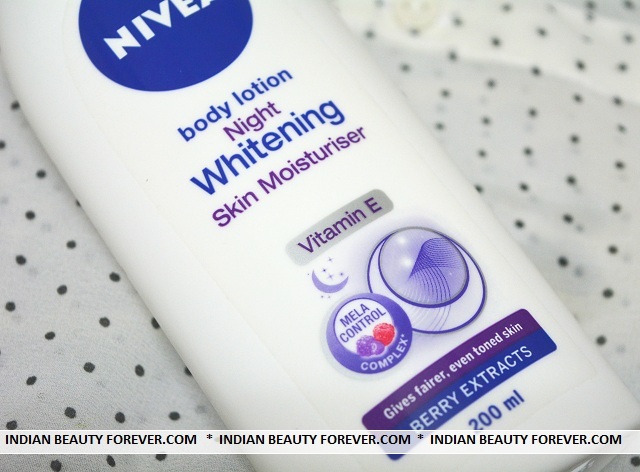 Nivea body lotion night whitening skin moisturiser with Vitamin E hydrates and nourishes the body. Regular use of this will even tone the skin and moisturizes. I like these new Nivea body lotions’ bottles. The White with Blue is a Typical Nivea trademark. The first time I used this, the one feature that made me like it was its smell. It has a sift subtle fragrance and a texture which is very light weight, moisturizing and yet non sticky. Just to give you a feel of its scent and texture, let me tell you that, it resembles just like the very popular Nivea cream, the blue tin packed one. It has a very similar scent with a light dash of lavender like scent, that I could detect and a texture which makes me feel that the Nivea cream has been diluted. It is very moisturizing yet after I have massaged it, it gets absorbed into the skin leaving a dewiness and faint glow. I don’t have dry skin thus it is very refreshing and non sticky. For my mum as well this acted well considering she has dry body skin and summers have arrived finally. May be for winters this wont be enough for her. It has berry extracts which are good for the skin but it also claims the whitening thing which I have not observed and it’s been 2 weeks that I am using this. I think it does the brightening as when I use this, my skin looks softer and dewy and also exudes a subtle glow. So, brightening is there, in that case. Not so far but whitening is not there but I see skin brightening. Decent body lotion for night time for summers to give the light moisturisation to the skin with the benefits of berry extracts and vitamin E to nourish the skin while you are asleep. PR sample, though the review is unbiased as always!! Nivea body lotions are awesome, this one's packaging is different though ! Thanks for reviewing this body lotion.. it sounds so good..